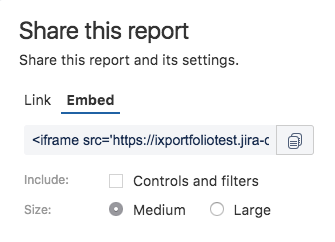 Portfolio for Jira lets you share reports containing the read-only data of a plan. Link - You can share the report with a link that enables the person who receives the shared report to open it up as read-only in their browser. Embedded - The view-only report is shared as an embeddable HTML iframe. Reports contain dynamic data that changes whenever your plan in Portfolio changes. This means that anyone who you share a report with will have a continuously updated view of your plan. If you no longer want the person you shared a report with to have a continuously updated report, you can remove their plan permissions. 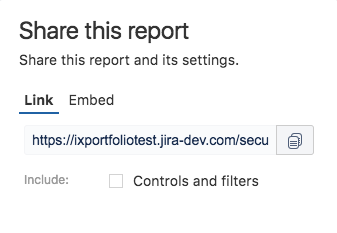 Before sharing a report, make sure you're logged into your Jira instance, and that you have the necessary Portfolio for Jira permissions and plan permissions. In your Jira application, go to Portfolio, and select a plan. Choose the report you want to share, with the report switcher. You can put the iframe link into the Confluence macro to make your reports show up and load automatically on your Confluence pages. Customize the size of the iframe by adjusting the width and height parameters. Note that setting the width to 100% will cause the iframe to span the entire width of the section in which it is embedded.